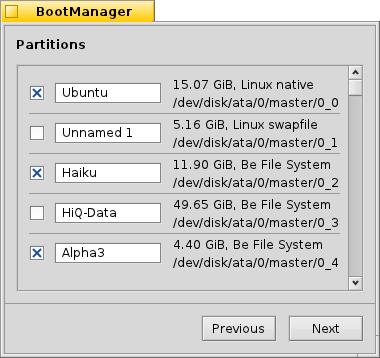 BootManager isn't yet tested very well and still has a few restrictions that it will complain about if they aren't met: the menu can only be installed on your first harddisk and there has to be a 2KiB space after the Master Boot Record (MBR). 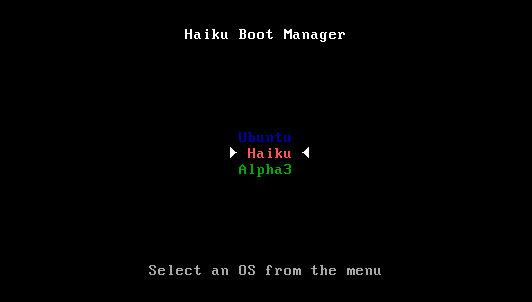 BootManager guides you through the installation process of the boot menu. 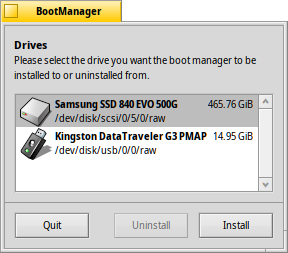 The BootManager starts off with a list of all available drives from which you choose the destination. 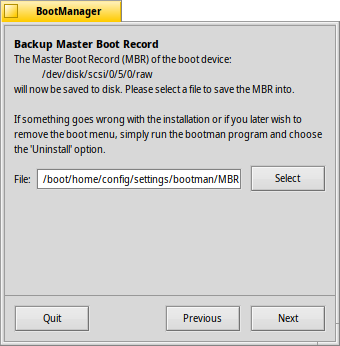 If there's already a boot menu on that drive, the Uninstall button becomes active, leading you through the simple procedure to restore a formerly backed-up MBR, thereby removing the boot menu. Otherwise, choose Install to continue. 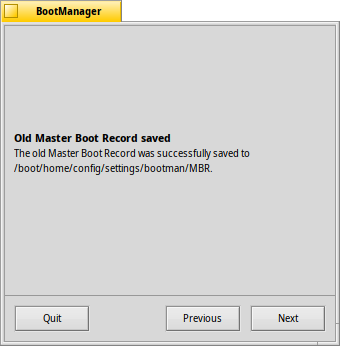 In case anything goes wrong or you want to remove the boot menu again, the Master Boot Record (MBR) is now saved. This is obviously a very important step, make sure you don't accidentally overwrite some other MBR-backup maybe from some earlier experimentation, for example! Just select a destination for the backup file "MBR" or leave the default path. After clicking Next you'll get a confirmation if the backup was successful. Next you're presented with a list of all partitions on the destination drive. 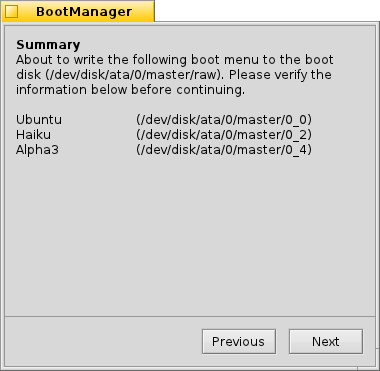 By setting checkmarks you decide what entries will appear in the boot menu, the text boxes allow you to rename an entry. After that, you pick from the pop-up menu which partition will be booted from by default and set a timeout with the slider below. Here, "Immediately" will skip the boot menu entirely, "Never" will just stop at the boot menu. You can override the timeout setting by holding ALT while booting. Before the boot menu is written to the MBR, you'll get a summary of your configuration and then one last chance to abort the operation. Don't worry though, as long as you keep the MBR backup safe, you can easily revert the changes. 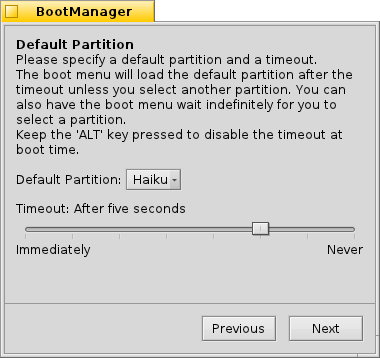 Should things get thoroughly messed up, you can always boot from a Haiku install CD or USB stick and write back the MBR backup with BootManager.